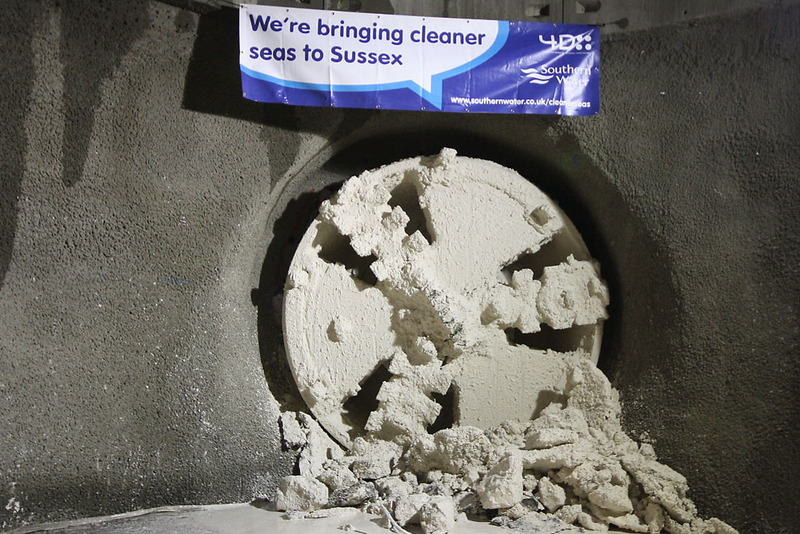 A significant milestone has been reached on Brighton’s US$480M Cleaner Seas for Sussex scheme when ‘Alice’, one of two 2.4m diameter Lovat TBMs being used on the project, broke through at the Marine Drive Pumping Station, completing the first of three drives being delivered for client, Southern Water, by the 4Delivery JV, consisting of Costain/MWH/United Utilities. The TBM had completed the 1.7km drive, which commenced in June this year, between the Project’s launch shaft at Ovingdean and the Marina Drive site. A total of 11km of tunnels are being constructed through the chalk at between 8 – 42m depth to link the existing Victorian sewer system to a new Wastewater Treatment Works being constructed at Peacehaven as part of the scheme. Julian Smith, Southern Water’s Project Manager, said: “‘Alice’ has been working out-of-sight with our miners since June to assist with the construction of the new sewer tunnel. Walking along the tunnel she has created really gives you an idea of the sheer scale of this project. ‘Alice’ will now be returned to Ovingdean where she will be re-launched in early December to construct a second 3.6km tunnel to Portobello Pumping Station. A second machine, ‘Hollyblue’, is currently 1,500m into a 3,732m tunnel drive from the treatment works site to Portobello Pumping Station, to complete the connection between the existing sewer network and the new treatment works. Shortly before the breakthrough, Howard Goodbourn, interim CEO of Southern Water, visited the tunnel drive. Howard has become a regular visitor to the project since his appointment, and further to a previous visit to the Wastewater Treatment Works he was keen to witness the efforts being employed to deliver the significant tunnelling works associated with the new scheme. Taking note of the requirement not to adversely impact on production rates at this key stage of the tunnelling works, Howard gave up his Saturday morning to visit the tunnel during one of the planned maintenance shifts. Commenting on his visit he stated that he was ‘very impressed’ with the ongoing works, and that this latest visit reinforces his positive view of the project.